We are in our fourth decade of restoring and decorating the historic homes of the nation’s capital area. Our historic restoration skillset includes plaster restoration, woodwork conservation, replication of wood trim, recreation of historic finishes, and wood window restoration. And, of course, the Color Alchemists can reproduce any historic decorative finish, including traditional faux finishes, gilding, marbling, wood graining and murals. Our restoration carpenters are experienced in the repair of structural and finish wood elements, as well as replicating existing original millwork, including moldings produced in the era previous to widespread standardization. We repair original woodwork to soundness with epoxy, or replace it, whichever offers the most reliable repair. To be sure of performance, we always use marine grade fasteners and rot-resistant spanish cedar and mahogany. One of our specialties is restoring wood windows to sound condition. We remove all paint, and if we find any unsound wood, we replace it with architectural grade epoxies. If it is not possible to restore the original work, we replace the damaged wood with new parts, milled to match the original from durable species. We then replace all historic glazing with salvaged or reproduction glass, selected to best match the original period. 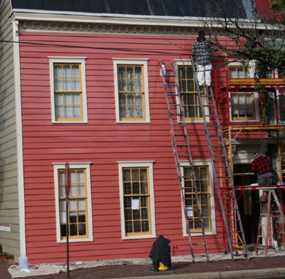 The ability to reproduce unique period millwork in short runs and on short notice is critical to the success of any historic restoration project. 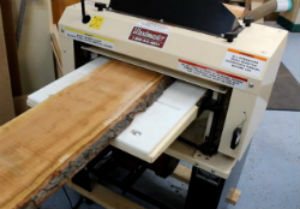 Often the extent of woodwork repair necessary is known only as the project proceeds. We just added a Woodmaster Molder Planer to our shop, and can now produce accurate custom molding profiles more quickly. Whether your project needs 10 feet of historic moulding or 1,000 feet, we can match it exactly and deliver it quickly.